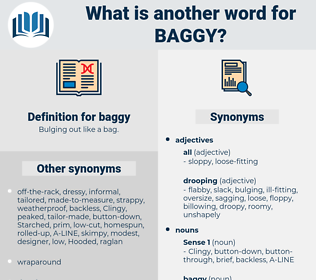 What is another word for baggy? 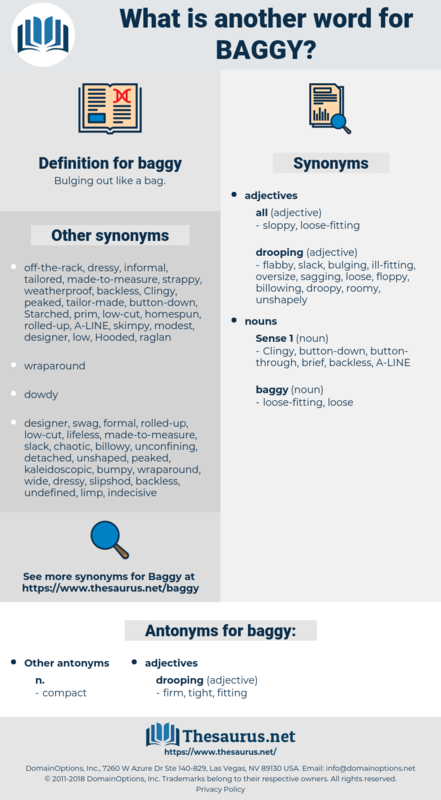 Bulging out like a bag.
" And that's why they all have baggy eyes," cried the girl. He proved to be as small as I had thought, not taller than my own shoulder, with a bent little figure dressed in wrinkled and baggy store clothes of a snuff brown. bosc, biface, beech, baku, bahasa, bauhaus, buzz saw, bioassay, bijou, bee house, bass, bise, BJS, boogie-woogie, Bok Choi, biskek, bazooka, be sick, bissau, bakehouse, backhoe, base, big cheese, bushwhack, basics, bouse, bough, besseya, back, beak, biophysics, bisayas, bakshis, befog, bioko, bookie, Baggie, basic, big H, bacca, boche, buzz, boogie, bush, besiege, beeswax, bask, Bok Choy, bacchus, bacchic, basque, basis, bike, bibos, bosky, bogie, bisque, bigwig, bivouac, basso, bobbysocks, baic, biopsy, boss, bosh, backwash, babyish, bag, bosch, buck, bos, bowse, bock, BCE, boyish, booboisie, bosie, bagassosis, bookcase, buggy, bog, bocce, back away, by choice, bio-assay, b.c., back saw, basuco, bias, bigeye, bbs, backache, Bokkos, beck, bocci, bs, buyback, beefcake, bse, beige, bozo, baby shoe, BJA, bigos, babushka, baggage, baby buggy, big, busy, buxus, bogy, bhaga, bagasse, boise, boggy, basia, bishkek, bossy, bogey, boozy, Bayes, biggish, bug, bake, bus, backsheesh, bakshish, BC, bps, beach house, beg, bouchee, boccie, baize, boxy, buckshee, byssus, biz, boccaccio, baby-wise, bagascosis, bk, bezique, bypass, bash, buss, booze, bookish, book, bassia, babassu, baas, box, bushy, bach, bucksaw, baisakh, babka, bose, Bay Of Biscay, beach, b.c.e., buckeye, backsaw, buxaceae, bize, Bosk, bogus, baiza, beseech, baksheesh, bobbysock, baccy, beachy, baisa, buy back.